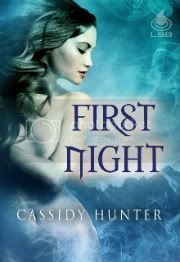 Selene is running from her abusive ex-husband, is at her wits end and out of money when she finds the small town of Moonrise. Although she finds the locals a bit unfriendly, she has nowhere else to go and no funds to get there. So she finds herself applying to work at the town bar and grill, the Crescent. Trey is a werewolf and the owner of The Crescent. He knows Selene is meant for him and his cook Michael, so he gives her a job. Both men know she is scared and running, but will Selene be able to accept their dual natures? Can they protect her when her past catches up to her? 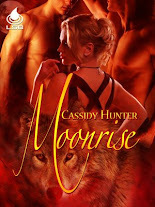 I enjoyed Moonrise by Cassidy Hunter. 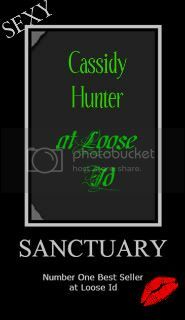 Selene was a woman who has lived intimately with fear and Ms. Hunter did not sugar coat its after effects. Selene's journey from meek to confident was wonderful to see. The milestones along the way made you want to smile along with her. Trey and Michael make an interesting pair. Ms. Hunter hinted at Michael's past but it was never explained. It may have been nice to find out why Michael felt such a connection to Selene outside of the fact that they were mates. Seeing how Trey's strength empowered both Michael and Selene was also a treat in this short story. Ms. Hunter did a great job of building a believable relationship between these characters. I also found the chemistry between the three realistic and fun.